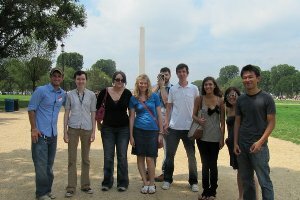 Transfer students and their mentors visit national monuments as part of the Honors Transfer Mentor Program. The University Honors Program announces the release of the September/October edition of its bi-monthly newsletter, Honorable Mentions. This issue includes stories about reinvestment in AU's undergraduate research, Honors' new program series on the issue of immigration, a personal account from an Honors Truman Scholar about her summer research, and an announcement of Honors Capstone Research Grant winners, among others. As always, if you have news to share with the University Honors Program, please e-mail your story to honors@american.edu.